Here's the picture that pro-abortionists and the media don't want you to see. 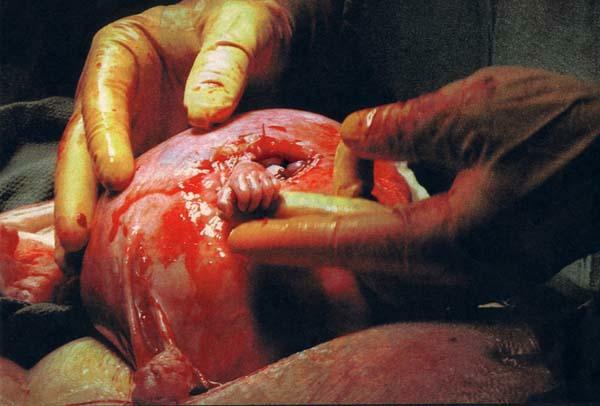 The tiny hand of a fetus reaches out from a mother's womb to clasp a surgeon's healing finger. It shows a 21-week-old fetus in its mother's womb, about to undergo a spine operation designed to save it from serious brain damage (by the way, at 21 weeks old, this baby could still be legally aborted). The tiny hand in the picture above belongs to a baby which is due to be born on December 28. It was taken during an operation in America recently. The baby is literally hanging on for life. For this is one of the most remarkable photographs taken in medicine and a record of one of the world's most extraordinary operations. The surgery was carried out entirely through the tiny slit visible in the wall of the womb and the `patient' is believed to be the youngest to undergo it. Samuel arrived on Thursday, Dec. 2 at 6:25 pm at Northside Hospital weighing 5 lbs 11 oz and 20 1/2 " long. He was born at 36 weeks but came into the world screaming his head off! He did not have to spend any time in a neonatal unit and came home with us on Monday, Dec. 6. After viewing an ultrasound of his brain, Samuel's neurosurgeon was very optimistic as he does not have any hydrocephalus and the brain malformation has resolved. He is moving his legs very well from the hips and some from the knees. He was frank breech (folded in half) in the womb and the orthopedist feels that he has a good chance for walking. He will begin physical therapy next week in order to work out some of the stiffness in his legs that was a result of his being folded in half in the womb. He is also nursing very well.